This year I am focusing more on the Biology of the birds and wildlife I photograph. For a decade or so my winter is a little more exciting when it comes to bird photography. It easier to locate and shoot the hawks and Kestrels. My fancy is photographing all wildlife. Due to weather, travel and my close proximity to world class bird habitat, winter is prime birding time. So off I go and chase the little (and) big critters that fly. The American Kestral. Always at the refuge. Always hunting. Can’t miss their tail feathers flapping up and down just after landing on a branch or power line. They eat insects, small mammals, birds and reptiles. Not really a migrator here in Utah I see them year round. Just love the winter shots. The snow usually highlights their bellies. They can be more readily seen with no foliage in the trees. The photograph below is a male. The male has a much more distinctive coloring. Especially down his back. The spots are much more prevalent on the male. They nest in cavities. At the refuge there are a couple of man-made nests that have been used by the Kestrels. They only have about a two foot wing span. Man! they can fly. Seen often hovering over prey along roadways. They are naturally shy. A very long lens is the best bet to get good photographs of the Kestrels. The phot0 below is shot with a 600mm lens with a 2x converter producing a 1200mm image. They are so quick and make such sudden changes that I am usually shoot at least 800 ISO. I have found myself up in the 3200 ISO range (thank you Nikon and the D3s). I almost always shoot wide open to get the highest shutter speed possible. In auto focus mostly. Shoot in aperture priority. I love this bird, He is beautiful. Look close at the bug wing just below the claws of the Kestrel on the branch…. 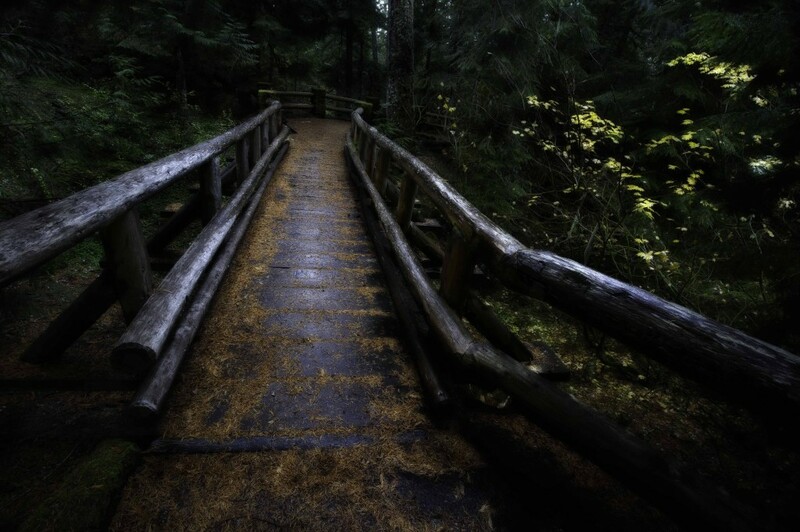 Time on the Oregon Coast will eventually take you into a wooded area. And possibly enjoying the manmade walkways. They are wonderful. They fit well into the environment. When raining and overcast they really standout….. The best of the best photographers have all agreed that rainy days can provide for the best photographs! On the edge of my whits in Oregon. Trying to get a permit at the very last minute. Literally. The store in Baker City was stocked. Everything ready to start operations. Including waiting customers. I sat in a DEQ office in Bend Oregon. Literally begging the permits manager there to not bend the rules. Instead just process the permit in a couple fho ours and not the usual 30-60 days. It was a very long shot. I anticipated the call to Maverik’s executive team…” sorry guys we have to delay the opening between 30 and 60 days”. YIKES! I was begging. Believe me! I felt like Jack Bower at an interrogation at gun point. Didn’t sleep the hole night before. It was on my shoulders. I don’t remember walking out of the building in pouring rain calling the area supervisor to tell him “go ahead and open. I got it” Felt like the one time mom forgave me for stealing the candy bar from Grand Central and not telling my Dad. Or the first time I kissed my sweetheart. Elated would be a slight understatement. Three days before my plane took me home. What to do? As a habit I carried well over 75 lbs. in photographic gear. 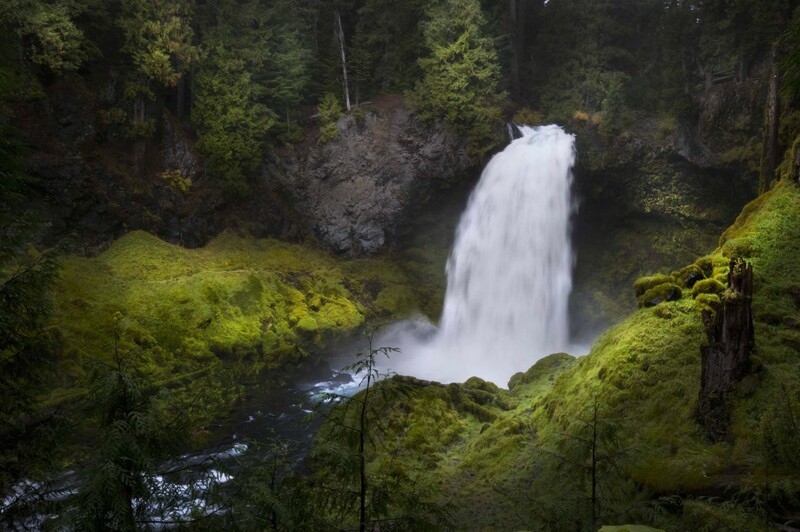 Bend is 3 hours from some of the most beautiful coast in the Americas. Fifty-five miles an hour was just not fast enough. Until I got to the first mountain range. Beautiful fall colors. In the rain the autumn hues were emphasized. The tree bark contrast was incredible. A photographers dream. I passed a small sign that pointed down a small to that said “falls”. Hey I have all day. Turned around and went back. Did not regret it. It was pouring as I hiked to the falls. The camera gear had all its rain protect in place. I did not. It was very cold as I turned the corner and gasped. A small burst of sun shone on the falls. Even where I shot from it was like a morning shower. I was drenched. Had about three to five minutes to get exposure, the correct shooting position and break out the gear. Forgot the tripod!!!!!!! DUMBY! I had to hand hold a 1/8 second exposure. My hope was to get a 9 exposure HDR image. In the end I think the single exposure worked to my favor. The contrast of the sun really popped without the HDR coverage. I love the shot……. Easy to get a a decent click out of. Pretty much they all look the same. 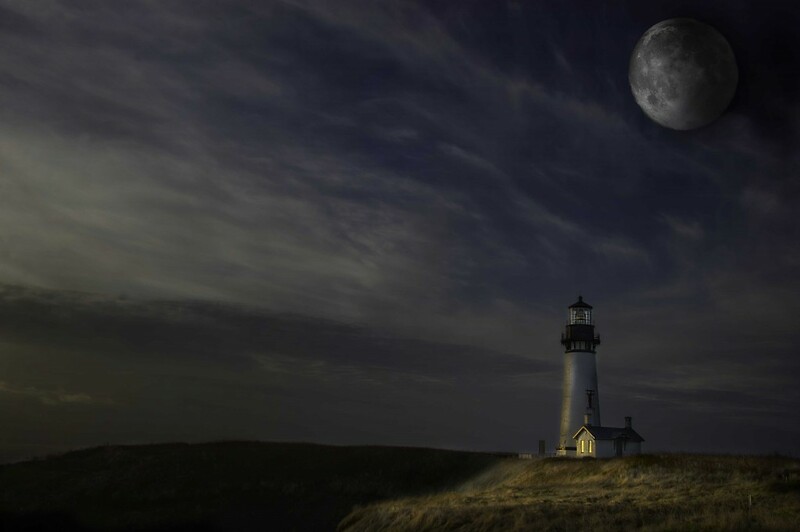 Clouds, weather and light play a factor…but best of all! When you are raised in the center of the U.S. going to the ocean is a spectacular experience. Last few miles before the the ocean appears through the windshield is intense. The anticipation building up. Then finally it’s there. Goes on forever. Loud and rhythmic. But difficult in many ways to capture in 2 dimension. Great contrast. High dynamic range. For most part I am not thrilled with most of my shots of the ocean every time I go. Still not thrilled……..
Ok so its been a while! 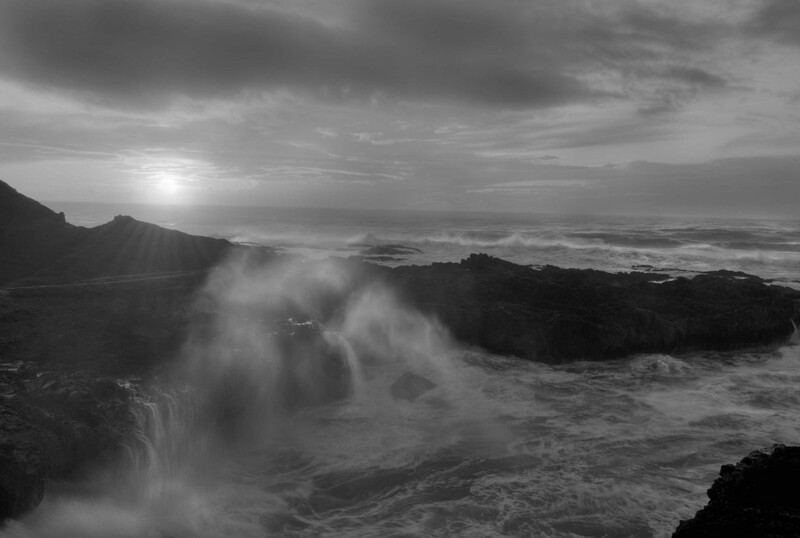 This last week my camera and I spent a few days on the Oregon Coast. Tough shooting scenics on the coast. Especially when raining the whole time. So I looked for critters. The ones with wings first. 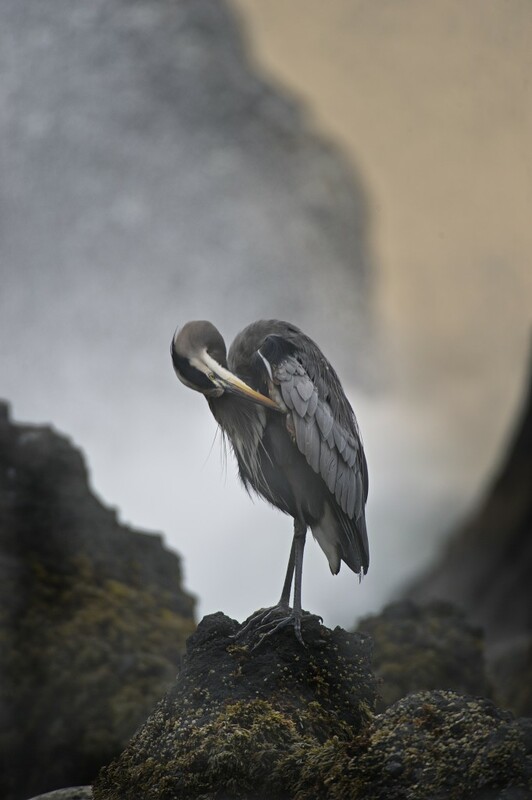 The background of the Great Blue Heron is the ocean breaking against the coastal cliffs. Kinda cool. 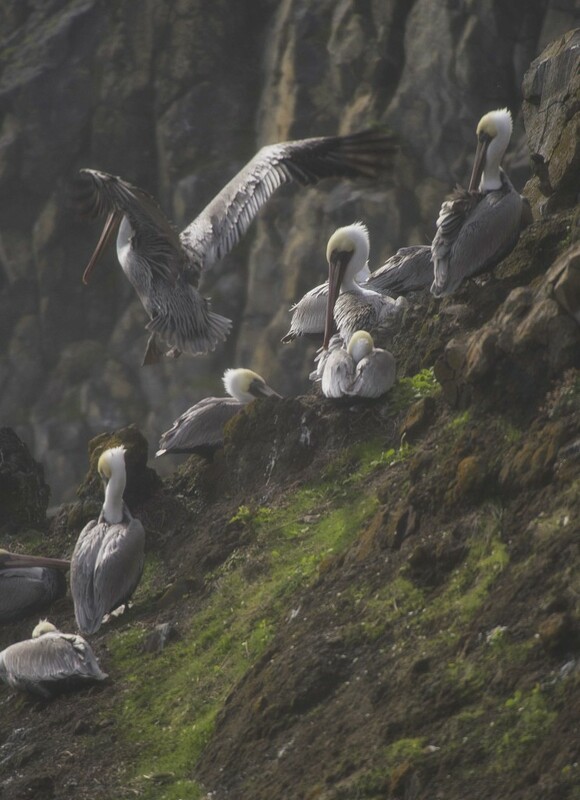 Never got shots of Pelicans on cliffs before.